Shing Chi Chiu's Home Of A Villain is indeed another triad movie but with one new twist. It may've been done before but by bringing the inner city triad back to it's roots, the movie definitely becomes worthy of examination at least. Judging by the name of the production company (Super Power Motion Picture Co.), the fact that a 2000 Hong Kong movie has entirely post synced dialogue and the production values, Shing Chi Chiu's movie is not a big budget one. On the other hand the material is suiting for a low budget effort and the director focuses on the resources he has. What we're left with is a disjointed drama saved by acting. Currently, Shing Chi Chiu only has Home Of A Villain in his filmography and the little you can interpret from this work is that he feels more at home with directing actors as opposed to showcasing highly skilled filmmaking. No time is wasted getting the movie going and in typical triad movie-manner, the opening is about rivalry between these groups of people followed by street brawling. Nothing here even approaches mediocre, in fact it's quite bad and worn out clichés is on display. The brawl itself has slightly more stylized choreography than expected but that results in the fights feeling overly staged and stiff. Thankfully they don't take up much of the running time but straightforward chopper violence would've been preferred. Shing does quickly take the viewer to Thailand where most of the film takes place though. Maybe it was a deliberate choice to portray the triad part of Home Of A Villain in a basic way in order to surprise the audience a little when it all turns into a family drama later on. Personally I think, again, the budget dictated a lot and the rest of the movie somewhat halts at a decent level because of it. Shooting on location enhances the Thailand part and Shing now begins to deal with the corethemes and the characters within it. You could make a case that Ray Lui's Kit goes from rough triad to down to earth son in a heartbeat but I believe it's logical because of his disease. He may have been unsympathetic and non-caring for a very long time prior but receiving news like this can turn any human being around in my opinion. It is very late for him to seek redemption but it's still not too late. Home Of A Villain features very little out of the ordinary when it comes to the writing and Shing Chi Chiu is nowhere near the sensitive talents of, let's say, Riley Yip. However the short length means that pacing remains good and during that the themes of family have been developed in an decent way. Despite that short running time, the movie features subplots that could've been left out. The filmmakers probably aren't the best at filling one entire movie and in Thailand a smaller triad plot is introduced. In addition to that a local politician's (Hui Siu-Mung) daughter falls for Kit which creates tension in the relationship he is in. It's just a few too many characters for this movie. Lau Keung Foo didn't get enough depth into other areas for a feature length film so he fills it out with uninteresting characters that are acted out terribly poor at times. Shing also tries to manipulate us with music which doesn't work for two reasons. One, the images are already fairly moving and two, the score is absolutely terrible. It sounds like music composed on an older computer and it doesn't work for any scene or moment. Actor Ray Lui actually carries Home Of A Villain up to the decent level. Am not overly familiar with his work other than his supporting role in 2000 A.D. and the nominated turn in To Be Number One. What you can say about him is that he's one of those actors that have the ability to convey much by doing little. 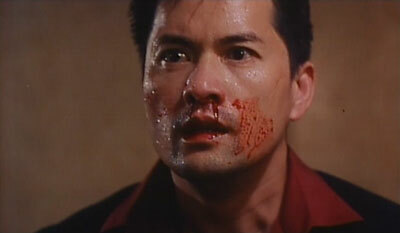 He possesses pretty good screen presence and the triad turned victim is nicely realized in Ray's hands. The scenes where his disease comes back to haunt him ranks as some of the best in the film. 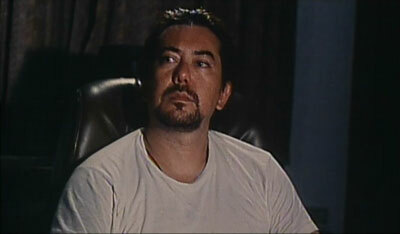 Anthony Wong also brings solid support as the brother but the character deserved better writing. The majority of his scenes are only about the hatred he has against Kit and I would've liked to see some more development than what we got at the end of the picture. Home Of A Villain breaks no new ground but the smaller doses of melodrama plus a good leading performance by Ray Lui all in all becomes a recommendation for drama fans. Widesight are reportedly now out of business and behind them they left some truly mediocre dvd's and only a handful of interesting movies. As per usual the widescreen images (1.85:1) is preserved but the print is the theatrical one, meaning we get burned in subtitles. Colours are very dull and this speckled print is pretty soft also. If you're familiar with Widesight's track record you'll know what to expect. Audio comes in Cantonese and Mandarin Dolby Digital 5.1. However this sounds like mono all the way. Sound barely leaves the center channel and the low budget origins of the movie is reflected in the sound as well. Dialogue is clear enough though. The English burned in subtitles features a few grammar errors and are readable at all times. There are no extras on the disc (unless you count the plot synopsis screen as one).